The modish redesign of Kilsyth Hall’s interiors is a fitting complement to the classic brick exterior of this apartment for rent in Brighton. Energy Star appliances and water saving faucets are among the many efficient updates that have been made to these Brighton MA apartments. The original hardwood floors have even been retouched with eco-friendly water-based polyurethane. Free heat and hot water, as well as our 24 hour maintenance response guarantee, come standard with your Brighton MA apartment. You can even pay your rent online! 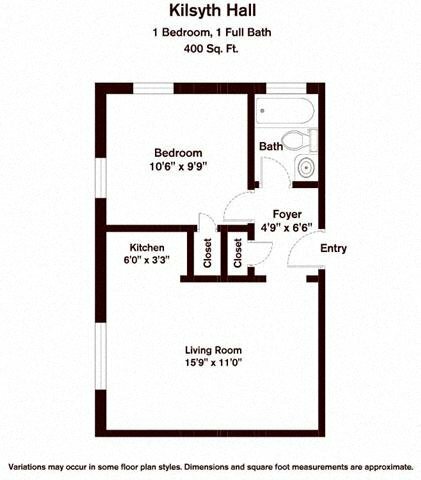 There are a surprising number of studio and one-bedroom flats to choose from among these apartments for rent in Brighton. A quiet sanctuary close to the city, these apartments in Brighton are within walking distance of Cleveland Circle, parks and public transit -- right on the Green B and C lines. The thoughtfully updated and efficiently designed apartment homes of Kilsyth Hall in Brighton, MA, combine traditional style and modern convenience. Each of the apartments for rent features updated and fully appointed kitchens, free heat and hot water, and environmentally friendly features such as water-saving faucets. The one bedroom apartment homes also share a number of community amenities, including elevator, controlled building access and laundry room. Located in Brighton, a residential area just outside of Boston, these apartments are close to an impressive variety of restaurants and shopping areas in Cambridge and Brookline. Only 15 minutes by car from the world-renowned museums and the unparalleled culture of Boston, one of America’s oldest and most historic cities, these apartments are also close to public transportation. Kilsyth Hall is mere minutes from the Green B and C lines of the “T”, Boston’s subway system, providing quick, inexpensive, and convenient transportation to the area’s vibrant attractions. The best local restaurants and shops are only a short walk away in Cleveland Circle and Coolidge Corner. Boston College, several local hospitals, and numerous parks and recreation areas are only a five minute drive.. Most importantly, Kilsyth Hall apartments in Brighton, MA, delivers a superior level of customer service. Your convenience and satisfaction are our highest priorities. Our 24-hour maintenance response guarantee means that repairs are dealt with promptly and professionally. Our convenient online rent payment option makes is possible to pay rent from home, work or anywhere with Internet access. You can count on our friendly and experienced staff to make your apartment at Kilsyth Hall a great place to call home. I've been living on Kilsyth for a year and a half, and everything has been great! Maintenance is always quick to respond whenever there's an issue, and management staff is very friendly and prompt getting back.